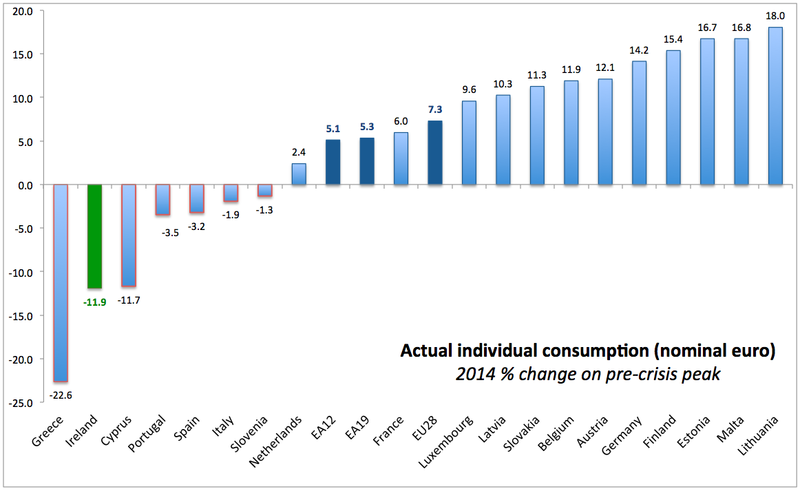 Couple of interesting charts showing the latest annual data on individual consumption in the EU. First, volume indices of real expenditure per capita in PPS (with index for each year set at EU28=100) (these figures are adjusted for inflation and exchange rates differences. 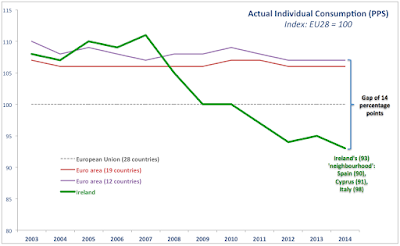 The chart shows how growth in consumption in the EU28 over time was coincident with decline in relative position of Ireland in terms of individual consumption throughout the crisis period. In 2003-2004 Irish individual consumption stood 8 and 7 percentage points above EU28 average. This was marginally below the EA12 average. 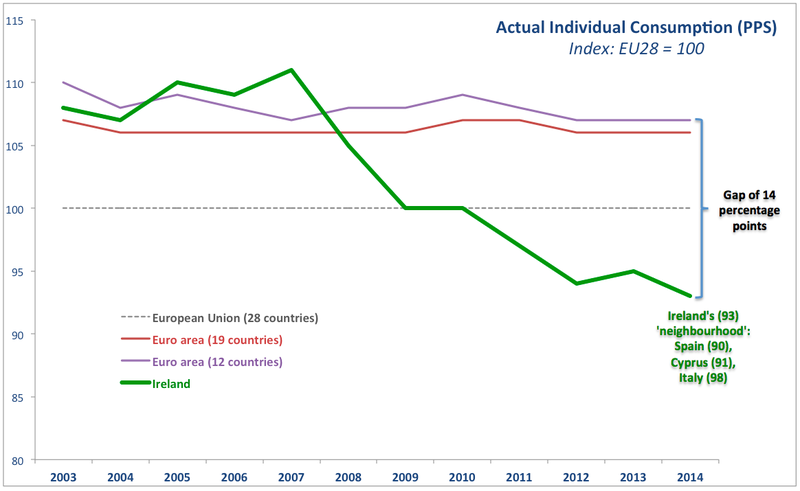 In 2005-2007, Irish individual consumption grew faster than consumption for EU28 and EA12, rising to 110 in index terms, or 10 percentage points above the EU28 and roughly 2 percentage points above the EA12. 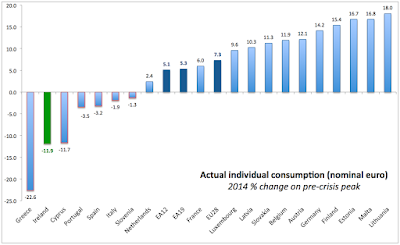 Since 2008, however, Irish individual consumption fell both relative to EU28 and EA12 figures. In the second year of 'robust recovery' - 2014 - Irish individual consumption (adjusting for inflation and exchange rates differences) hit the period low of 93 - full 7 percentage points below EU28 and 14 points below EA12. As the result of the crisis, our real consumption per capita was down 16.2% on 2007 levels, which is the second worst performance after Greece (down 17%). Our performance was much worse than a 13.6% decline registered in the U.K., 10.6% decline registered in Iceland, 9.9% drop in Cyprus, 9.7% decline in the Netherlands, 8.2% drop in Spain and so on. In summary, even after the onset of the 'fastest recovery' in the euro area, Ireland's actual individual consumption of goods and services remained au-par. In 2014 itself, our individual consumption grew 6.0% y/y - second fastest in EU28 after Luxembourg - but years of past devastation meant that our consumption remained second worst hit compared to pre-crisis levels. In 1999, Ireland ranked 12th in terms of individual nominal consumption in the EU 28 group of states. Our best year was attained in 2008 when we ranked 3rd. In every year between 2011 and 2014, we ranked 11th. In simple terms, the entire history of the euro area membership for Ireland has been equivalent to, largely, standing still in terms of our relative wellbeing compared to other EU states.